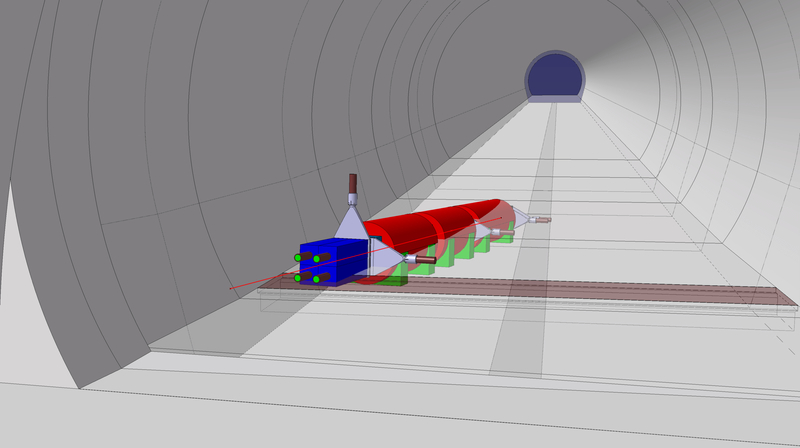 FASER (ForwArd Search ExpeRiment at the LHC) is a proposed experiment to be situated 480m along the line-of-sight of the proton collisions in front of the ATLAS interaction point at the LHC. Preliminary studies show that a small experiment at this location has significant prospects for discovering a variety of light, weakly-coupled new particles, such as dark photons, dark Higgs bosons, heavy neutral leptons (sterile neutrinos), and axion-like particles, which could be produced in the decay of particles produced in the LHC collisions, or in the interaction of these particles with material. The FASER experiment is part of the CERN Physics Beyond Colliders study group. FASER was approved by the CERN Research Board on March 5th 2019. For the internal FASER site (protected), please follow this link: InternalFaserSite. For decades, the leading examples of physics beyond the standard model were particles with TeV-scale masses and O(1) couplings to the standard model (SM). More recently, however, there is a growing and complementary interest in new particles that are much lighter and more weakly-coupled. Among their many motivations, such particles may yield dark matter with the correct thermal relic density and resolve outstanding discrepancies between theory and low-energy experiments. Perhaps most importantly, new particles that are light and weakly-coupled can be discovered by relatively inexpensive, small, and fast experiments with potentially revolutionary implications for particle physics and cosmology. inelastic pp scattering events for an integrated luminosity of 300 fb-1 at the LHC (3 ab-1 at the HL-LHC). Even extremely weakly-coupled new particles may therefore be produced in sufficient numbers in the very forward region. Due to their weak coupling to the SM, such particles are typically long-lived and travel a macroscopic distance before decaying back into SM particles. Moreover, such particles may be highly collimated. For example, new particles that are produced in pion or B-meson decays are typically produced within angles of θ ~ ΛQCD / E or mB / E of the beam collision axis, where E is the energy of the particle. For E ~ TeV, this implies that even ~500m downstream, such particles have only spread out ~ 10 cm - 1 m in the transverse plane. A small and inexpensive detector placed in the very forward region may therefore be capable of extremely sensitive searches, provided a suitable location can be found and the signal can be differentiated from the SM background. FASER, the ForwArd Search ExpeRiment, is an experiment designed to take advantage of this opportunity. It is a small detector, with volume ~1 m3, that will be placed along the beam collision axis, several hundreds of meters downstream from the ATLAS or CMS interaction point (IP). Figure 1: Left panel: Map showing the proposed location of FASER in the TI12 tunnel. FASER's location is 480 m away from the ATLAS interaction point on the beam collision axis, after the LHC ring starts to curve. 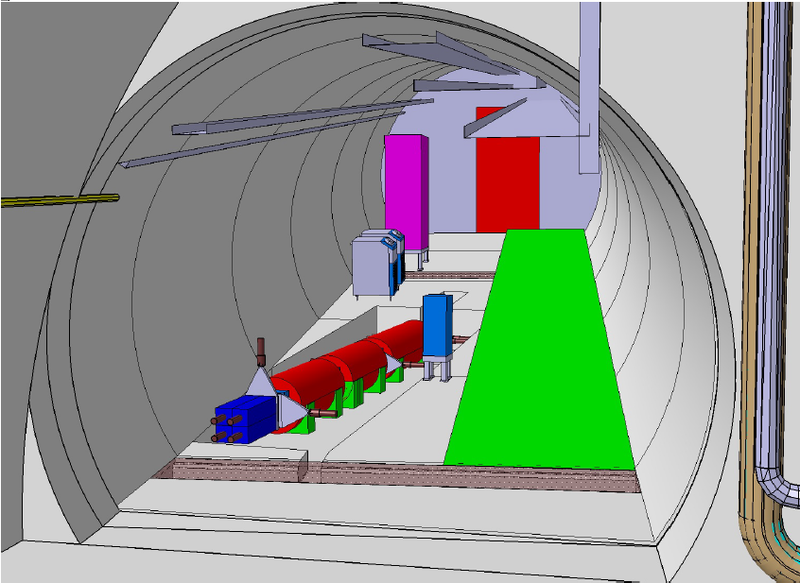 Right panel: A model of the FASER detector situated at the proposed location in the TI12 tunnel. Figure 2: A schematic drawing of the LHC and the very forward infrastructure downstream from the ATLAS interaction point. As shown in Fig. 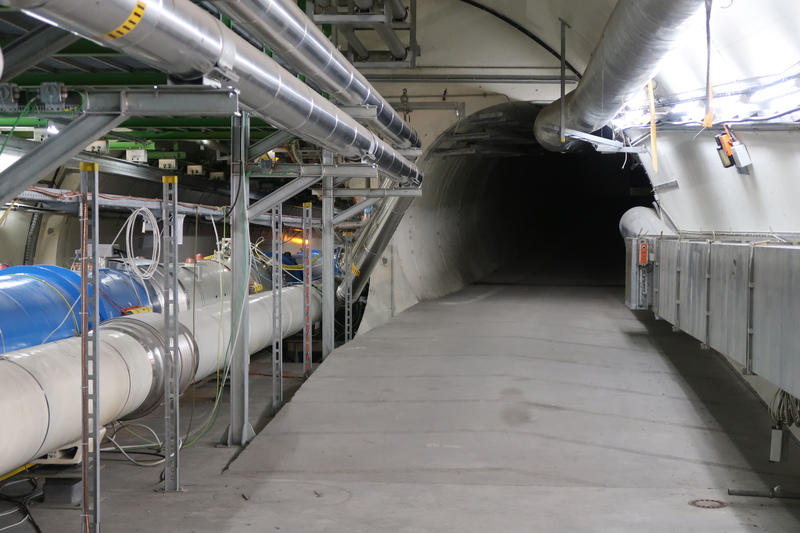 1, FASER will be placed along the beam collision axis, in the side tunnel TI12, 480m downstream from the ATLAS IP after the LHC tunnel starts to curve. (A symmetric location on the other side of ATLAS in tunnel TI18 has also been considered.) 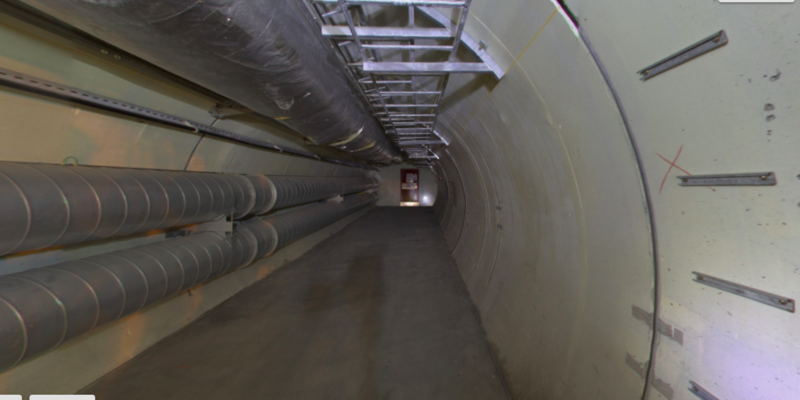 The TI12 tunnel was formerly used to connect the SPS to the LEP tunnel, but is currently empty and unused. As shown schematically in Fig. 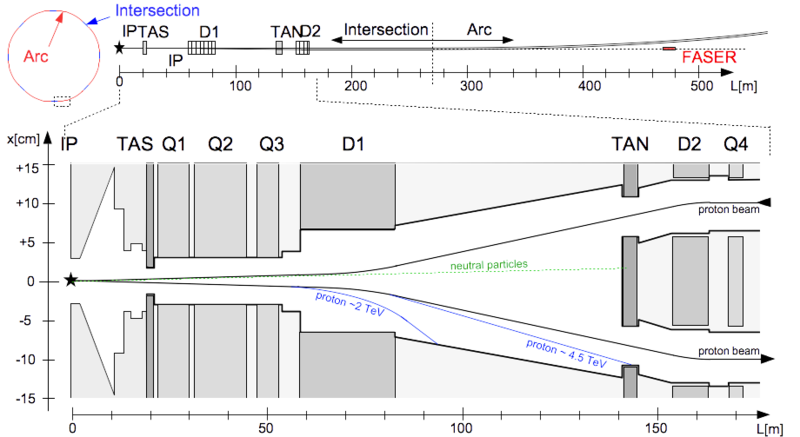 2, the beam collision axis passes through TI12 close to where it merges with the main LHC tunnel. 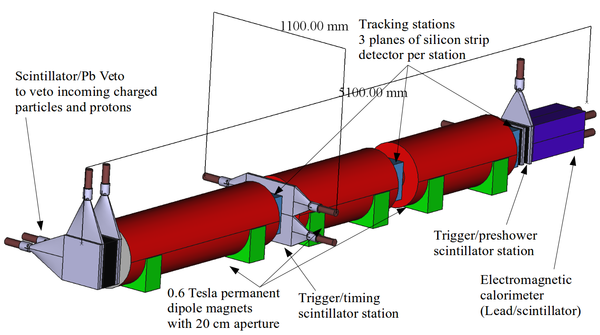 A more detailed study of the intersection between the beam collision axis and TI12 verifies that there exists space for FASER in the tunnel. 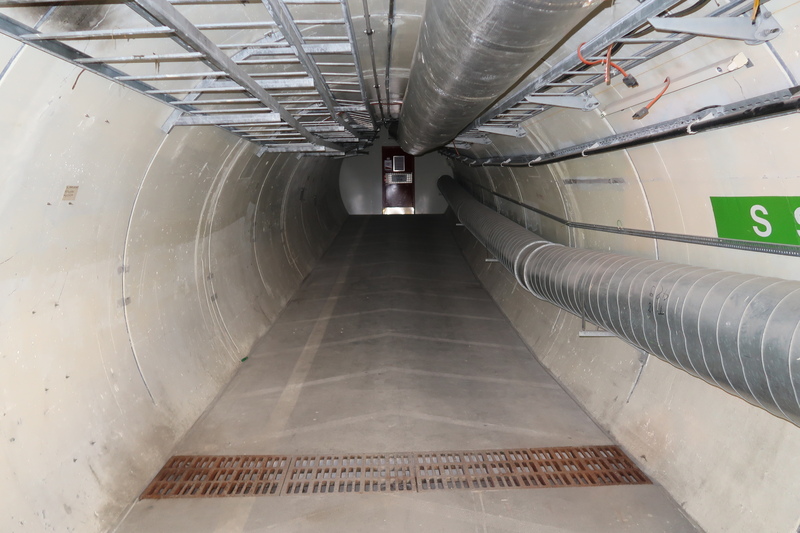 Because of the geometry of the tunnel, the line-of-sight (LOS) is below the tunnel floor as it enters the tunnel, and then emerges from the floor. 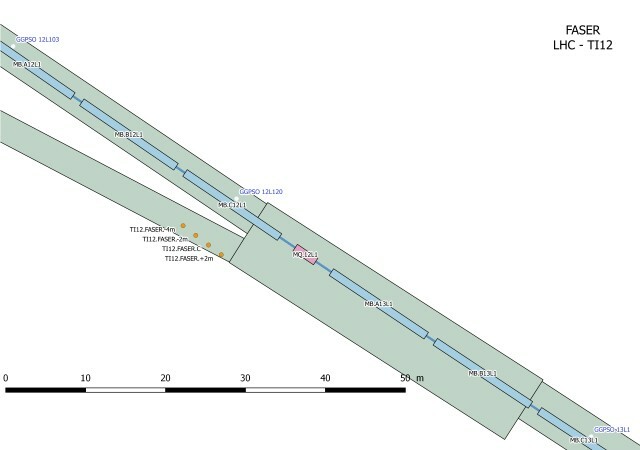 Measurements from the CERN survey team show that, with the allowed digging that can be done in Long Shutdown 2 (LS2), a roughly 5 m-long detector can be fit in TI12 (see Fig. 1 right). 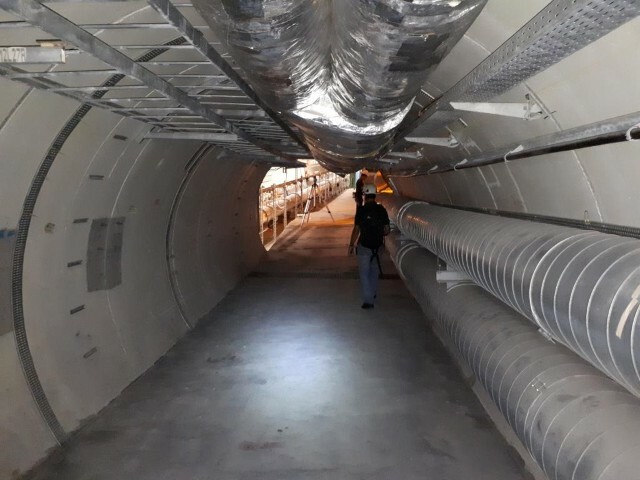 In this location, FASER harnesses the enormous, previously "wasted,'' cross section for very forward physics (σ ~ 100 mb), which implies that even very weakly-coupled new particles can be produced in large numbers at the LHC. In addition, the production of long-lived particles (LLPs) at high center-of-mass energy results in long propagation distances d ~ O(100) m and decays that are far beyond the main LHC infrastructure in regions where the backgrounds are expected to be negligible. LLPs produced in the very forward region of the beam collision axis typically have very high energies E ~ TeV. Although the identity of the LLP decay products depends on the mass of the LLP and the concrete new physics model, a characteristic signature is expected of two or more stable charged particles, such as electrons, muons or pions. This leads to a striking signature at FASER: two oppositely charged tracks with very high energy that emanate from a vertex inside the detector and which have a combined momentum that points back to the IP. A measurement of individual tracks with sufficient resolution and an identification of their charges is therefore imperative if the apparatus is to make use of kinematic features to distinguish signal from background. A tracking-based technology, supplemented by a magnet and possibly a calorimeter to allow for an energy measurement, will be the key components of FASER. The FASER signals are two extremely energetic (~ TeV) coincident tracks or photons that start at a common vertex and point back to the ATLAS IP. Muons and neutrinos are the only known particles that can transport such energies through 90 m of rock between the IP and FASER. Estimates based on detailed simulations and in-situ measurements show that muon-associated radiative processes and neutrino-induced backgrounds may be reduced to negligible levels. FLUKA simulation study from the CERN Sources, Targets and Interactions group has been carried out to assess possible backgrounds and the radiation level in the FASER location. The study shows that no high energy (>100 GeV) particles are expected to enter FASER from proton showers in the dispersion suppressor or from beam-gas interactions. In addition, the radiation level expected at the FASER location is very low due to the dispersion function in the LHC cell closest to FASER. 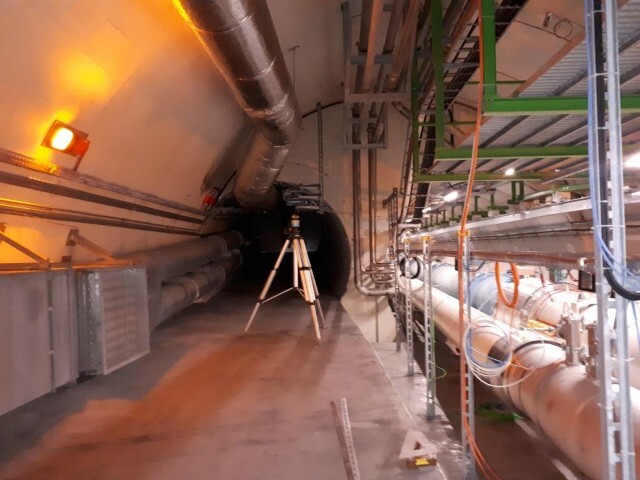 To measure particle fluxes at FASER’s location, emulsion detectors were placed in the TI12 tunnel, as well as in the symmetric tunnel TI18 on the other side of the ATLAS IP beginning from June 2018. The collected data correspond to the total integrated luminosity of about 10 fb-1. The first analyses show that in situ measurements agree well with the FLUKA simulation given the uncertainties in the detection efficiency and uncertainty in the simulations. The results of the measurements will be further analyzed and will complement and validate the background estimates and inform future work, which includes refining background estimates, evaluating signal efficiencies, and optimizing the detector. To be sensitive to the many possible forms of light, weakly-interacting particles, and to differentiate signal from background, the FASER detector has several major components. These components and the detector layout are shown in Fig. 5. Figure 3: Layout of the FASER detector. LLPs enter from the left and the entire length of the detector is roughly 5 m. The detector components include scintillators (gray), dipole magnets (red), tracking stations (blue), a calorimeter (dark purple), and support structures (green). Particles produced at the ATLAS IP enter the detector from the left. 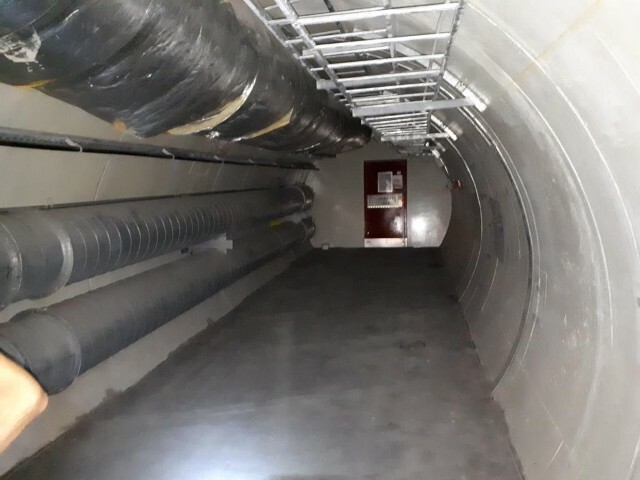 At the entrance to the detector is a double layer of scintillators (gray) to veto charged particles coming through the cavern wall from the IP, primarily high-energy muons. Between the scintillation layers is a 20-radiation-lengths-thick layer of lead that converts photons produced in the wall into electromagnetic showers that can be efficiently vetoed by the scintillators. The veto layer is followed by a ∆ = 1.5 m long, 0.6 T permanent dipole magnet (red) with a R = 10 cm aperture radius. Such permanent magnets take up relatively little space and, unlike electromagnets, do not require high voltage power and cooling. The cylindrical volume enclosed by this magnet serves as the decay volume for the light, weakly-interacting particles, with the magnet providing a horizontal kick to separate oppositely-charged particles to a detectable distance. 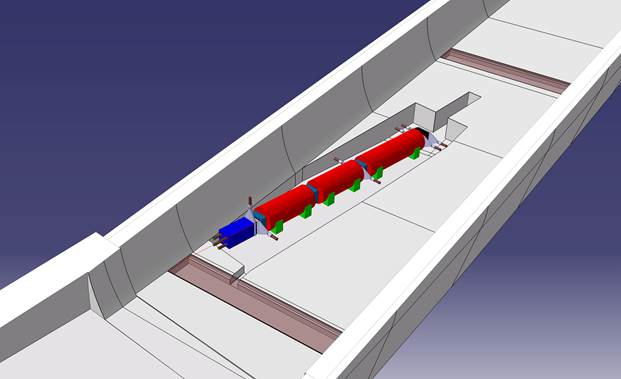 Next is a spectrometer consisting of two 1 m-long, 0.6 T dipole magnets with three tracking stations (blue), each composed of layers of precision silicon strip detectors located at either end and in between the magnets. The primary purpose of the spectrometer is to observe the characteristic signal of two oppositely charged particles pointing back towards the IP, measure their momenta, and sweep out low-momentum charged particles before they reach the back of the spectrometer. Scintillator planes (gray) for triggering and precision time measurements are located at the entrance and exit of the spectrometer. The final component is an electromagnetic calorimeter (purple) to identify high energy electrons and photons and measure the total electromagnetic energy. As the primary signals are two close-by electrons or photons, these cannot be resolved by the calorimeter. Figure 4: Projected FASER exclusion reach for dark photons (left), dark Higgs bosons (center), and HNLs (right) parameter space in the corresponding coupling vs. mass plane. The gray shaded regions are excluded by current experimental bounds, and the colored contours represent projected future sensitivities of other proposed experiments that search for long-lived particles. The physics reach at FASER for these models is shown in Fig. 4. Here we assume that backgrounds can be reduced to negligible levels. The gray-shaded regions of parameter space have already been excluded by previous experiments. For comparison we also show the projected reaches of other proposed experiments that search for long-lived particles. Dark photons (left) are mainly produced in the decay of light mesons or via dark bremsstrahlung and are therefore very collimated around the beam collision axis. Already a very small detector with radius R = 10 cm and length ∆ = 1.5 m is able to probe large and unconstrained regions of parameter space, making dark photons an ideal short term goal for FASER. In contrast, dark Higgs bosons and HNLs define a good long term physics goal. They are both mainly produced in heavy meson decays, leading to a larger spread around the beam collision axis. A larger, but still relatively small, detector with R ~ 1 m is then required to exploit the full potential of FASER. Note that FASER's physics potential is not restricted to the models mentioned above. It has been shown that FASER can probe axion-like particles, flavor-specific scalar mediators, inelastic dark matter, neutralinos and U(1)B-L-gauge bosons. Additionally, studies for FASER's potential to discover strongly interacting massive particles are underway. Importantly, FASER will start probing unexcluded region of the parameter space of popular models with light long-lived particles immediately after the beginning of the LHC Run 3. In particular, in Fig. 5 below we show the FASER sensitivity reach in searches for dark photons and axion-like particles with dominant diphoton coupling that correspond to only 10 fb-1 of the integrated luminosity and compare it with the expected sensitivity for 150 fb-1 obtained during Run 3 from 2021-23. Figure 5: Projected FASER exclusion reach for dark photons (left) and axion-like particles with dominant diphoton coupling (right) parameter space in the corresponding coupling vs. mass plane. Two FASER lines are shown that correspond to 10 fb-1 and to a full 150 fb-1 integrated luminosity, respectively. The proposed timeline is for FASER to be installed in TI12 during Long Shutdown 2 (LS2), in time to collect data during Run 3 of the 14 TeV LHC from 2021-23. FASER's cylindrical active decay volume has a radius R = 10 cm and depth D = 1.5 m, and the detector's total length is under 5 m. FASER will run concurrently with the LHC and require no beam modifications. Its interactions with existing experiments are limited only to requiring bunch crossing timing and luminosity information from ATLAS. If FASER is successful, a larger version, FASER 2, with an active decay volume with R = 1 m and D = 5 m, could be installed during LS3 and take data in the 14 TeV HL-LHC era. FASER 2 would require extending TI12 or widening the adjacent staging area UJ12. Please also contact a FASER theorist - we are happy to assist and and answer your questions. Administrative support is provided by Veronique Wedlake from the CERN, EP Secretariat.